Location: Rhyd-y-Fro, Wales. (SN 697 063). 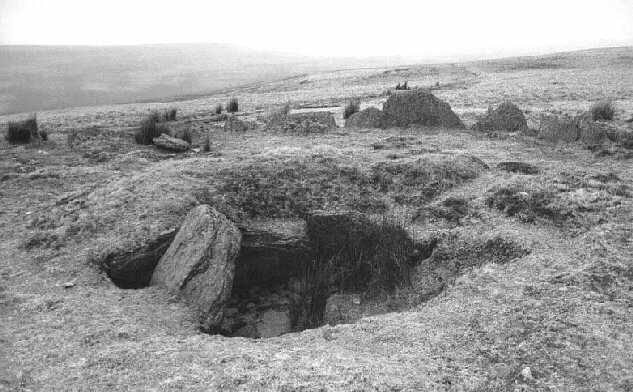 Grid Reference: 51° 44' 23" N, 3° 53' 9" W.
Carn Llechart is one of the largest ring cairns in Wales. Unfortunately the capstone for this ring-cairn was removed in recent times, and is now a part of the more recent, nearby monument to the gas-board. Perhaps ironically, the site has been suggested as having once had a sulphur-spring under it. 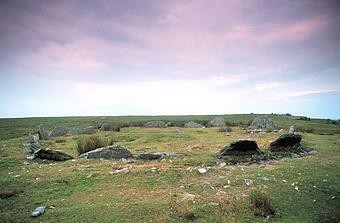 Description: The circle is 12m (40ft) in diameter, consisting of 25 outwards-facing stones, and the central cist has its east side stone and capstone missing. It seems that there is no entry to the circle and no trace of a covering mound.The cairn appears vividly against the skyline when it is approached along the track-way from the North. It is an unusual circle of 25 stones leaning slightly outwards and surrounding a central burial cist. Aubrey Burl in his "The Stone Circles of British Isles" wrote that such rings were thought to be the first stage of development of stone circles, but that these cairns, however, are almost certainly too late to provide such an ancestry. The reverse seems likely, that the existence of stone circles elsewhere impelled people to place tall stones around the bases of their own round cairns, a fusion of traditions resulting in monuments like spiky coronets. The site is loosely dated at 'late Neolithic to early Bronze age'. In the area there are also a Neolithic burial chamber. The Cairn lies around 300m east of the Tor Glawydd high point. Similar settings can be seen Bryn Cader Faner in Wales, and Arbor low in England.